If you had a chance to beam just one message across one of the world’s most iconic landmarks, as well as via an online live stream that was potentially being watched and re-watched by millions of people – what would you say? Would you talk about yourself? Or Kanye West? Donald Trump? Would you send an affirmation or a condemnation? A message of hope or one of loss? 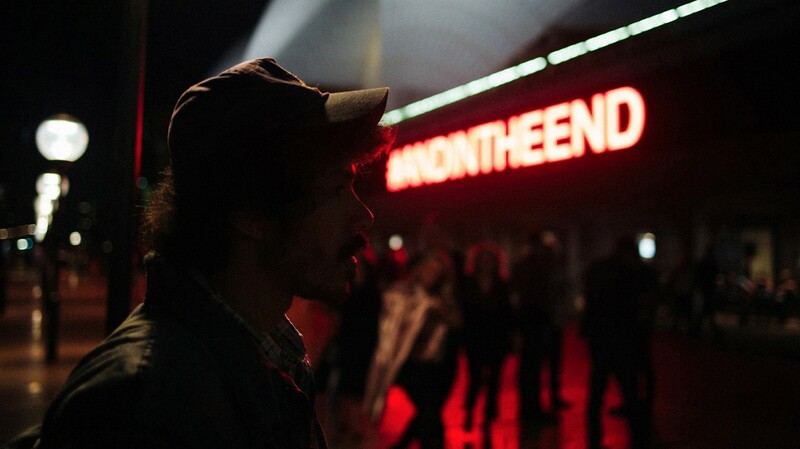 Last weekend, LaBeouf, Rönkkö & Turner (Shia LaBeouf, Nastja Säde Rönkkö and Luke Turner) staged their latest performance, #ANDINTHEEND, inside the Joan Sutherland theatre of the Sydney Opera House as part of the city’s BingeFest. The premise was to invite the public, one-by-one, to stand in front of the three artists with a statement, an admission, a thought, a question… anything. Their only request was that each person would begin with “And in the end”. Ideally, whoever walked into the amphitheater, knowing that they had the world’s eyes and ears on them, would be considerate in some of their closing words of 2016. 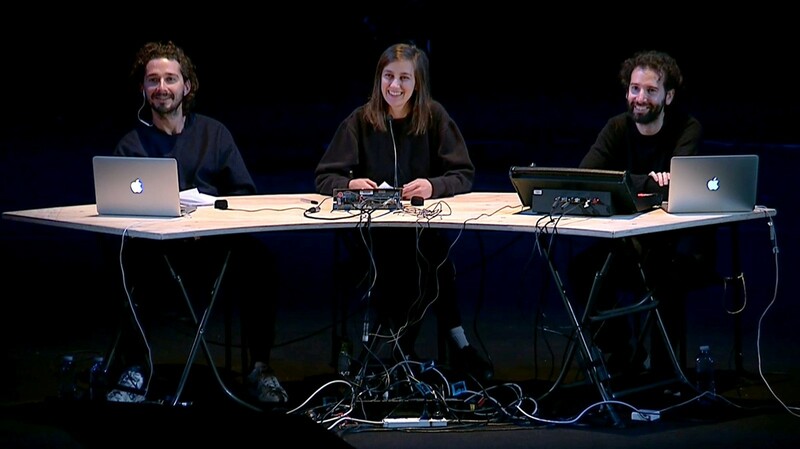 Each message was then recited by either LaBeouf, Rönkkö or Turner and broadcast via a 60-metre-long LED ticker on the outside of the Opera House. The two-day performance (staged Saturday 11.59am – 6am and Sunday 10pm – 6am) was set in motion with, “AND IN THE END, THIS ALWAYS WAS, ALWAYS WILL BE, ABORIGINAL LAND”. It was a sobering introduction – something rarely acknowledged publicly in Australia – and was followed by a range of emotions and messages, from the irreverent, self-centred and quizzical, to the serious, heartbreaking, and pensive. Some missed the point entirely, by choosing to instead bask in LaBeouf’s star power while others questioned whether they should have used the bathroom beforehand. Everyone entering the room was put under the microscope of human behaviour, whether they realised it or not. However, for the most part, the silent stream – except for the fuzz of white noise punctuated by LaBeouf, Rönkkö or Turner’s voice – provided catharsis as the inner-most thoughts of a stranger attempting to piece together what has essentially been an unexplainable year were revealed. Over email, LaBeouf, Rönkkö & Turner spoke exclusively with us about how #ANDINTHEEND came about, its political intentions, their frustrations over the mainstream media’s interpretations of it, and whether or not they believe that the end is really here. How did the concept for #ANDINTHEEND come about and what purpose do you hope it serves? Luke Turner: Like everyone, it seems this year, we’d been thinking a lot about endings, about our current collective predicament. The work was intended as an open-ended platform to articulate our shared anxieties, and to think through where we’re headed together, and what is truly important in the end. Nastja Säde Rönkkö: After we were invited to take part, we brainstormed a few possible ideas. It felt like the beginning of a dark year, and we wanted to give voice to people, and we thought it was kind of badass to project people’s messages, any message, onto the Opera House. We thought a lot about the building and what it means, how iconic it is, beautiful yet intimidating. Why did you choose the Sydney Opera House as the venue? Nastja Säde Rönkkö: They chose us. They invited us to be part of BingeFest, and of course, we were psyched and said yes. Danielle (the producer) had seen the line during #ALLMYMOVIES in New York, and loved the vibe. Luke Turner: We were limited only by the times we had access to the building, working around the Australian Ballet’s programme, and the comings and goings of the super-sized cruise ships in the harbour that blocked sight lines to the Opera House. The timings we were left with, through the dead of night, perfectly suited the concept of the piece as a sort of after-hours occupation, and heightened the sense of strangeness upon entering the empty auditorium. What responses were you hoping to get from the public, and in turn, what are your thoughts on the responses you got? Nastja Säde Rönkkö: I was hoping that people would use their voice and get political. I also expected that the responses would vary a lot, and they did. At the end of what is being described as a catastrophic year – was your intention for this project to provide a level of catharsis to the public, or even to yourselves? Nastja Säde Rönkkö: Yes for both! And to look into next year with a spirit of a warrior, with new energy and hope, to be stronger than ever! Luke Turner: The piece was planned way back in February, so we couldn’t have known just how bleak things would get as the year wore on. The sense of foreboding has only intensified, whilst at the same time it feels vital to make sure events of the past 12 months are not in any way normalised. Fittingly, I would say that at times the project voiced a distinct sense of urgency, rather than any kind of cathartic release. I definitely experienced this when, for example, the alarming – and to the point – words, “AN INTERNET TROLL IS THE PRESIDENT OF AMERICA”, beamed out in 200-foot-wide text across the harbour for the world to see. As a landmark with such global visibility, the building served as a beacon to amplify all those voices that engaged with us inside the theatre. Trump himself recently declared that “the theatre must be a safe and special place.” I disagree with this emphatically; the theatre must surely always be a dangerous and special place. Hopefully, through the strength of personal and political statements that emerged during the project, this sense of danger and urgency was felt. We are just days post a terrorist attack in Berlin, a public shooting in Turkey, climate change is destroying our planet, and the horrifying situation in Aleppo continues. With these social, political and environmental issues in mind, what were your intentions behind #ANDINTHEEND? Nastja Säde Rönkkö: To give voice to people and to broadcast their voice loud and bright. My intention was to listen and to make people listen. To hopefully remind people the power we all have in our choices, that at times like this we have to stick together and support one another, even when, and especially when, the world is so dark and going through a massive social and political backlash. Luke Turner: “AND IN THE END, NOT A SINGLE PERSON QUESTIONED IT” And yet, I hope this project provided some kind of resistance over those two nights. It is art’s role, now more than ever, to offer resistance, to continually question, and to provide a stimulus for new beginnings. Do you believe we are nearing the end? Nastja Säde Rönkkö: Yes, the human race, and as a result of our actions some other species too, are nearing the end. We are self-destructive, and we’re all in this together – all meaning everyone and everything on this earth. On the other hand, the planet will survive in one form or other, it always does. It’s a rapidly changing, often-violent planet, and we have been here for a very short time. It is said that five times in the history of earth most life has disappeared as a result of our changing planet, and some people say we are at the beginning of a sixth extinction. It is just very likely that this time we’ve made a massive contribution towards it. It’s very sad. Luke Turner: Only through building these types of connections can we resist the end, and endure. There were some humourous and less serious responses but also a lot of emotional and genuine ones – how are you feeling at the end of the performance? Were you moved or touched, saddened, angered etc, by any in particular? Nastja Säde Rönkkö: Sometimes it looked like the Opera House itself had opened up and was speaking its own inner thoughts, as if it has voice of its own. It was amplified because the messages were so varied. It was very emotional. One message in particular, and the way it was delivered, “AND IN THE END, THE WHITE MAN WINS”, was very difficult for us to deliver. It felt hopeless and sad and wrong to see it on the wall of the Opera House. It didn’t come from a white man. I misheard it at first, I thought she said “In the end, white men will leave.” Sometimes I guess, with a few of the less serious responses, I was also annoyed, when I thought, is this really what you want to project onto the Sydney Opera House when you can say absolutely anything at all, and this is your message to the world? I was also moved a lot. So many wonderful, caring, beautiful people. It’s revealing that the media has so far avoided reproducing these more emotive and political statements, instead focusing largely on pop-culture-inspired contributions (which nonetheless played their part), such as “AND IN THE END, EVERYTHING COMES UP MILLHOUSE” or “AND IN THE END, I HOPE THAT KANYE IS OK”. For the most part, your performances have a common thread, that of, as you said Shia, "accessibility, intimacy and community". Why are these three themes so pertinent and important to your work? Nastja Säde Rönkkö: It is what really matters, in the end. Luke Turner: Art is a conversation, and without these sort of dialogues and connections, nothing will change for the better. Nastja, before the performance, you told Australian newspaper, The Age, “Human connection always leads to something. Connections are a starting point, a way to get somewhere but we don't know where that somewhere is. It is different for everyone every time”. Now we are at the end of this performance, do you know where that “somewhere” is yet, whether collectively or individually? Nastja Säde Rönkkö: I still don't know exactly where that somewhere is, but I feel through these works that I momentarily glimpse it. As the final days tick on towards a new year – how would you sum up your own 2016 experience? Nastja Säde Rönkkö: It feels pretty psychotic to be quite content in my life, yet sad and angry and terrified about the world at large. Luke Turner: For me, in some small way, the project meant that 2016 – a pretty grim year to live through – has ended with a renewed sense of hope, thanks to the humanity we experienced over those two magical evenings, both on and offline. Lastly, I'm going to ask you to finish this for me. "And in the end...."